This can be as benign and innocent as simply inputting some personal data in order to get access to a white paper or an email newsletter. Every time that a site visitor lands on your website, especially specific webpages like your landing page, you want to turn him into a conversion. The profitability of your business depends on it! So how do you influence and persuade your site visitors to convert into leads and then actual buyers? These killer tips will tell you all that you have to know. At first, web designers may not relate appealing typography with greater conversion rates. After all, typography is all about aesthetics, isn't it? Not really. Effective typography provides a practical benefit as far as conversions go: It directs site visitors to the most important aspects on your webpage. These elements will naturally be things like calls to action. The most important elements on your landing page, for instance, ought to have the biggest and most attention-drawing headings. Other content that's less vital - for instance, a menu bar or the actual text - only need relatively small though still easily readable font sizes. Follow this rule about typography, and you'll reach the web-design nirvana of awesome design, stellar readability and a good user experience. This naturally increases conversions. 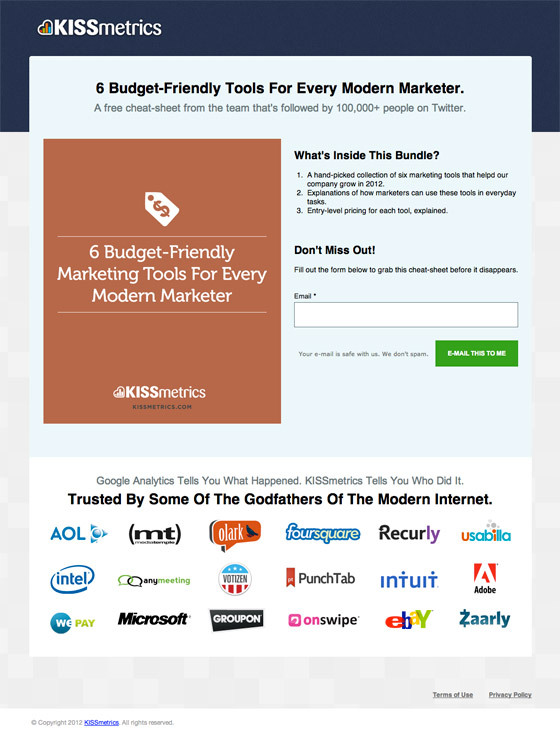 This screenshot of a KissMetrics landing page features attractive and simple type, big headings and also a call-to-action button in green. It's a fact of life that people respond to different colors in different ways. Research has even been done on this, so to increase conversions, just pay attention to the color scheme of your landing page, for instance. This study right here proves that certain companies obtained different conversions based on the colors they chose for their web-design elements. The fact of the matter is that the use of colors taps into a human being's emotions. And your site visitors are all human beings, right? So why not use the color scheme to your advantage in this case to increase your site conversions? According to the abovementioned study, changing call-to-action buttons and brand colors to green produced more conversions. 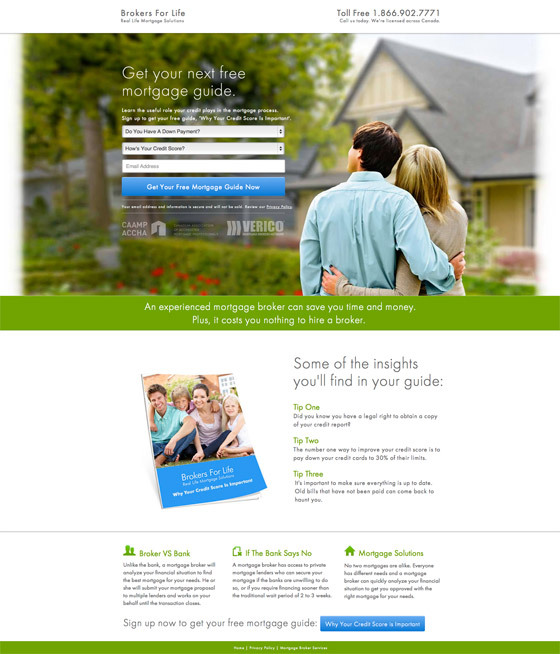 This screenshot of the landing page for Brokers For Life features a predominant, green color, both in the graphics and image. The visual hierarchy and the user flow go hand-in-hand to help web designers create a greater conversion rate for their clients. Establishing a successful visual hierarchy comes down to concentrating on what your site's primary goal will be. Establishing this will work toward directing your site visitors to completing the site goal. The site goal is usually the call to action, whether that's a real purchase or just signing up for something. As a web designer, you have to organize a page in such a way that the most vital elements will impact the site visitor's decision and prompt him to the eventual conversion goal. In this way, you're directly leading the thought process of your site visitors. The page has to be laid out in such a way that site visitors tend not to ignore these vital elements. For instance, the size of the headline has to be bigger than the rest of the copy on the page, and the call-to-action button must have a contrasting color that hasn't been used anywhere else on the page. This will cause it to pop out to the site visitors, enhancing the chances of a conversion. 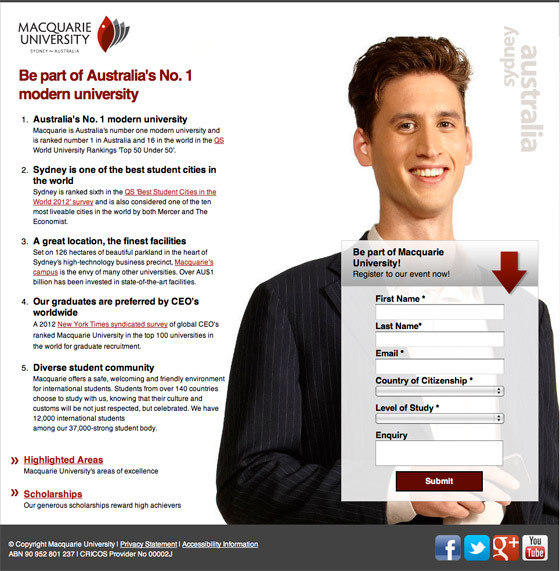 This screenshot from Australia's Macquarie University landing page has a well-organized visual hierarchy and user flow that talks up the benefits of attending the University before directing site visitors to submit their information. A landing page shouldn't be boring by any means, which is why you want to include some images, but there are best-practices do's and don'ts to follow. For one thing, you should use the rule of thirds whenever you can since it grabs the attention of your site visitors. Further, you want to also make a shameless appeal to the site visitors' superficial sense of beauty and attraction: Research shows that pictures of subjectively attractive women and babies raise conversion rates! On the flipside, you definitely don't want to use stock images excessively because they look cheap and irrelevant. Instead, also incorporate infographics or charts that illustrate what you're writing about. 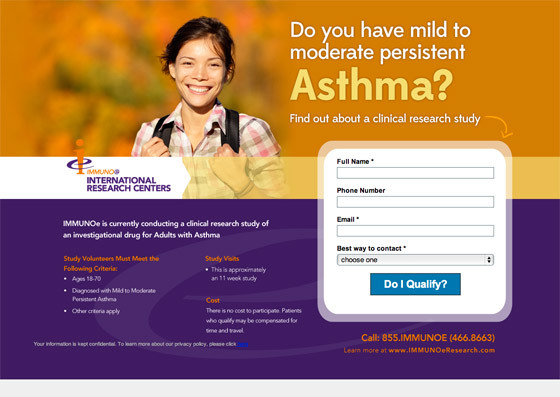 This screenshot for IMMUNO International Research Centers features an attractive, smiling woman. 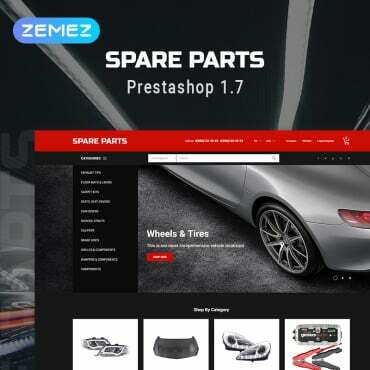 If you have a B2B, B2C or B2G website, you want to make money with it, plain and simple. There's everything right with wanting to make money and wanting to increase your profits, too, of course. These tips will help you do just that very effectively. By simply adjusting around some elements of your landing page and making crucial, web-design decisions based on sound research, you can make a marked impact on your site's conversion rate. 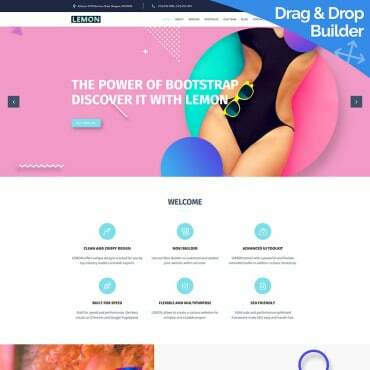 Even what seems to be a small design decision, such as the wrong color here or there, can have a noticeably negative effect on your site's conversion rates. That's because site visitors are such funny and fickle creatures! Ever had to design a landing page yourself? If so, what did you find out worked best and what didn't? Unburden yourself to us by spelling it all out in the comments section below!